I Love Photo Gifts in general and photo collages in particular. There is nothing better than having the smiling faces of your loved ones right in front of your eyes. It raises wonderful memories and it brings a big smile to my face. 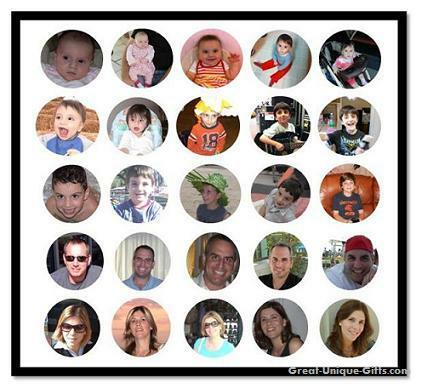 Jen from eighteen25 made a lovely circle collage for her son's 6th birthday. She took pictures of him from the past 5 year and arranged them from the youngest to the oldest. I loved the idea that you get to see him grow in a snap. My first year - Babies grow so much in their first year. They actually turn from tiny babies to little toddlers. Make a photo collage from photos that were taken during the first year – especially pictures of the first times – first smile, first tooth, first time sitting, standing… If you're looking for unique first birthday gifts this is your gift! The parents will love it (and the kid too – in some years). I'm Growing - If you want to make unique baby shower gift, why not creating a photo collage of the growing pregnancy? Take photos of the mom-to-be that show her belly growing from the beginning of the pregnancy until almost exploding :0). This will make a lovely keepsake. Happy Birthday - Every birthday we take photos of the birthday boy/girl with the gorgeous birthday cake. Make a "Happy Birthday" collage for your kid using photos from the first birthday till the current. I wish you - You can make unique photo cards by creating a photo collage as the card itself. Write each word on a nice paper and ask someone to take a picture of you holding each poster – then make a photo collage out of these photos and put it in a nice frame. This can be an excellent last minute birthday gift and a great teacher gift (instead of words write each letter on a paper so all the kids get to take an active part – here is an example ). Who am I? – Our kids love to wear costumes especially on Halloween or Purim. They look so cute so we take lots of photos. Now it's time to share them. Create a display of your child's costumes over the years. Our love - If you need unique anniversary gift for your parents give them a photo collage gift with photos of them together from their wedding until today arranged in chronological order. This is a lovely present that shows their growing up (physically and spiritually) over the years. Daddy and me - A collage of "Daddy and Me" will be one of the perfect father's day gifts. Get physical - A great Valentines gift for your child's teacher would be a card written with the students' bodies . Every 2-3 kids will form a letter of a short greeting like – "We Love You Miss ___". You can take photos of your kids writing "Love You Mom" with their bodies and give your wife the best Valentine gift. Creating a photo collage is quite simple. Select pictures, re-size and shape them, place them and put in a frame. That's it! You can use a circle punch collage (or any other shape you like) as Jen did. Or you can create it using the computer. I used Microsoft Word for resizing and shaping the photos. The big downsize is that you are limited to A4 paper size. You can try photography stores or printing businesses – maybe they can print it on a larger paper. Paste the photo on a word document. Use the CORP function to re-size it (picture tools -> corp). If you want to turn the photo to a circle (or any other standard shape) use CORP to turn it to a square. Then use the PICTURE SHAPE function to turn it to a circle (pictures tools -> picture shape -> choose the shape you want). Add the reshaped photo to the collage using COPY and PASTE and use the mouse to re-size the photo so it would be on the same size as the rest of the photos (I worked with 2 documents – in one I reshaped the photo and then I copied it to the other document, where I built the collage). Repeat the process until you've placed all the pictures. 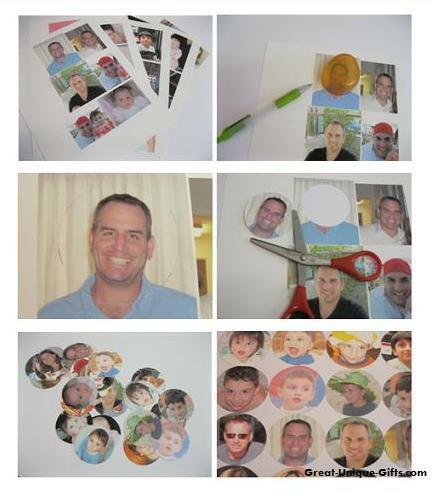 Print the collage on a quality photo printing paper. Cut the extra paper to fit the frame (I made a square collage) and frame it.